The runners anxiously awaited the signal to start the Chicago marathon . Each carried a personal reason for being there; each envisioned what lay ahead at the finish line. Unsure of exactly what would happen between the start and finish, they knew this: in the marathon anything can happen. They also knew that the marathon they were about to begin was of world-class caliber, with significant city, corporate and community support and involvement. It was aggressively organized to be the World’s Best Marathon, with no expense spared, no detail left unchecked. Elite marathoners had committed to participate, and were expected to deliver unparalleled competition and record-breaking results. As many as ten percent of the city’s population would line the streets to cheer the runners as they passed by. The marathon course was flat and fast, encouraging hope that a new world record would be set by an elite runner. The route would take runners through a showcase of the City of Chicago’s proud and diverse neighborhoods including Grant Park, Lincoln Park and the South Side. It was a marathoner runner’s dream. It was just like the world-class marathon the city and runners have come to expect year after year in Chicago. Except this one was different. This race was the First Chicago Marathon . It was one hundred and five years ago: September 23, 1905. In early 1905, the newly-formed Illinois Athletic Club made a bold decision: Chicago would set the world standard for the marathon in terms of size, support, ethics, and athleticism. The marathon would epitomize everything that Chicago and its citizens represented: character, strength, spirit. “Chicago’s first marathon is to be held this afternoon under the auspices of the new Illinois Athletic Club,” noted the Chicago Tribune’s morning edition. Even with expectations set high, the first Chicago Marathon lived up to the hype. At 2pm on that late September day, fifteen determined runners bolted at the sound of the starter’s gun to begin an amazing journey of distance and endurance. Huge crowds witnessed a thrilling race that had it all: action, disaster, suspense, a fallen favorite and a cliff-hanger ending. It was epic, defining a new chapter in Chicago’s athletic history. The marathon course started at the Evanston Golf Club, headed eastward toward Lake Michigan, then southbound along the lake to Grant Park, and then further south to finish in the Washington Park horse-racing track. Among the runners included in the elite field were Sidney Hatch of River Forest, a 17 year-old running phenomenon, who had earned 8th place in the 1904 Olympic Games, held in St. Louis. Small in stature but large in heart and spirit, Hatch delighted spectators and earned loud cheers. 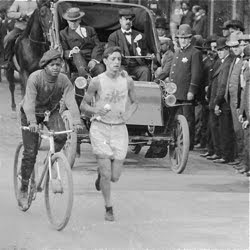 Albert Corey ran representing the Chicago Athletic Club and had won the marathon silver medal at the 1904 Games, Corey. Many were convinced that Corey should have been awarded the Gold medal because the winner used performance enhancing strychnine and alcohol concoctions during the race. Louis Marks, representing the Mohawk Valley Athletic Club of New York was the race favorite. And it was no surprise that Marks sped ahead from the start, heading southeast through Evanston on Ridge Road. After about 5 miles, the runners veered right onto southbound Sheridan Road. The surface of the road was unpaved, and considerable dust was dispersed into the air by vehicles and bikes, to the consternation of runners. A few runners paused for lemons and oranges as means of immediate relief from throat irritation before continuing. Marks remained in the lead, but not out of sight of Metzner and Kennedy, for the next several miles. By then, Marks was completely surrounded by vehicles and crowds that had continued to grow in size as the race wore on. But he was tiring; as he approached 39th Street, he slowed to a walk. With six miles to go, this was not good. Seeing Marks in distress, Metzner suddenly became fresh and energized, steadily speeding up from the rear to take the lead. Fearing defeat as Metzner moved far ahead, Marks dug deep to respond, catching up to run even with Metzger the next few blocks. But it seemed that only a race delay could allow Marks time to get his energy back. Almost unbelievably, upon approaching 40th Street, it appeared that an arriving freight train would delay the race. But the train engineer obliged officials, and let the runners through. Soon after, with two miles to go, the Marks and Metzner were running nearly side-by-side. It was not clear who had the upper hand; it could go to the wire. Then the unexpected: Marks suddenly collapsed at the side of the road. He had nothing left. The race had been turned on its side. The favorite was gone, and Metzner sped onward to enter Washington Park race track. Running onto the track, Metzner was shocked to hear the creams of 15,000 spectators who had paid for the opportunity to witness the epic finish. And then it was done. Metzner took the victory, Kennedy finished second, and Marks was taken to the hospital. The first Chicago Marathon was history. Fifteen runners started the race, seven finished, including the disappointed Sidney Hatch and Albert Corey. No records were set, but in the end it didn’t matter. The race was seen as nothing short of epic by organizers, spectators and runners. And there was always next year. In years to come, the marathon would continue to capture the imagination of Chicago with exciting races and unpredictable outcomes. In 1906, the Chicago Marathon created a new course that would remain the standard for years to come. The new course began at Ravinia Park in Highland Park and ended in Grant Park in front of the Illinois Athletic Building at 112 South Michigan Ave. This course overlapped the current Chicago Marathon route over several North Side miles. After the 1907 marathon, the Chicago Tribune led with this headline: “Sleeping Runner Loses Marathon; Lindquist Trots Two Miles as Somnambulist; Collapses a Mile from Goal.” No one had seen anything like it, and naturally struggled to describe what today’s runners know as ‘hitting the wall’. By 1909, the finish area of the Chicago Marathon at the Illinois Athletic Club had become a gathering spot for tens of thousands of spectators. Bands entertained finishers from the balcony, and runners were able to enjoy an after-marathon party, much like the current Chicago Marathon finish area celebrations at Columbus and Balbo. Year after year the city and communities rallied around the marathon as one of the most extraordinary events in the nation. Chicago Marathons continued until the World War I timeframe, then resumed in the early 1920s. However, as the Chicago and the nation faced growing challenges in other areas, interest in the marathon waned. This year marks the 110th anniversary of that first Chicago’s Marathon , and the race has become one of the largest and most popular marathons in the world, a race where elites come to break world records, and where first-time runners simply want to become a marathon finisher. And now, every October, Chicago is home to more than 40,000 runners – from the world’s best to complete novices – who will start, discover, battle, and ultimately finish something they once thought impossible, even ridiculous: the Chicago Marathon. 26 miles, 385 yards. In many ways it’s no easier today than it was in 1905. Like the 1905 inaugural race, today’s Chicago Marathon route is an unparalleled city showcase, passing Millennium Park, the Loop, Lincoln Park Zoo, Lake Shore Drive, the Lyric Opera House, The Mercantile Exchange, Greek Town, Chinatown, the White Sox ballpark, Sears Tower, and finally, the Grant Park finish area. It’s a spectacular journey, but, as in 1905, not one without its challenges. There is a point for every marathon runner when, in the face of increasing fatigue, aches, pain and the devilishly tempting opportunity to simply stop, they will choose to continue. Why? Because the runners are there for a reason: to fulfill a once-in-a-lifetime goal; to run a personal best; to disprove those who say they can’t; or simply to do something once seemed beyond reach. It’s as true today as it was at the first running of the Chicago Marathon , on September 23, 1905. One hundred and four years later, organizers, spectators and runners agree: the marathon continues to be nothing short of Epic. Excerpts from “Chicago Marathon” by Raymond Britt, and published by Arcadia Publishing.